An independent trial in Poinsettias has shown that growers can significantly boost operational margins by employing the highly nutritious food supplement Nutrimite™ in Bemisia tabaci control strategies. Ecophyto, in the context of the French government’s programs aimed at lowering the use of plant protection products, was looking for ways to optimise B. tabaci biocontrol. The trials, carried out at “Astredhor Sud-Ouest GIE Fleurs et Plantes” in the South-West of France showed how Poinsettia growers can greatly benefit from using Nutrimite™ in combination with predatory mites. B. tabaci has become the primary pest in Poinsettia production in Western Europe. A worldwide pest and virus vector, this whitefly originated in sub-tropical crops but has since spread to protected crops in temperate areas − including most of Europe. In addition to virus transmission, B. tabaci causes direct damage by its feeding activity as well as indirect damage through sooty moulds developing on honeydew excreted on the host plant. In Poinsettia crops the presence of sooty mould generally leads to plant rejection, impacting on commercial margins. In a bid to improve the biocontrol strategy, the Ecophyto trial compared two strategies. In Plot one A. swirskii was introduced at 100/m² together with Nutrimite™ pollen bi-weekly at 500g/ha plus Eretmocerus eremicus and Encarsia formosa. In Plot 2 A. swirskii was again introduced at 100/m² but this time in combination with the bio-insecticide Mycotal at 1kg/ha and E. eremicus and E. formosa. The Ecophyto trial involved five varieties of Poinsettia – Bella Italia Red, Bravo Bright Red, Premium Polar, Premium Lipstick Pink and Premium Ice Crystal. Regular applications of Nutrimite™ in Plot 1 had a spectacular effect on swirskii development and on overall B. tabaci control. With a whitefly population beneath the damage threshold, Plot 1 had the highest % of Class 1 Poinsettias commanding the best price. These plants had no visible sooty mould. In contrast, in Plot 2 the pest was not kept beneath the damage threshold and resulted in 9% unmarketable plants due to visible signs of sooty mould. Incorporating Nutrimite™ in the control strategy can boost turnover by reducing the number of unmarketable plants. Moreover, the superior result in Plot 1 was achieved at less than half the cost: plant protection cost for Plot 1 was 1,08€/m² compared to 2,32€/m² for Plot 2. In terms of labour cost, Nutrimite™ applications can be made three times more quickly than swirskii applications – this adds further to the bottom line. All in all the Nutrimite™ strategy helped increase operational margin by a substantial 33%. The 2015 trials confirmed the important effect of Nutrimite™ on swirskii development. Following four applications of Nutrimite™ and only two introductions of swirskii at 100/m², the predatory mites were found on 70% of the plants. However, in spite of the high swirskii population in the crop, the Bemisia tabaci population did exceed the damage threshold at certain times. To achieve good biological control of Bemisia careful monitoring throughout the season remains crucial. “Also in North-America Poinsettia growers are satisfied with the integration of Nutrimite™ in their biological control strategy”, says Rosy Pauwels. Schmidt Brothers Inc (Ohio, US) is pleased with the results of the new program set up in 2015 together with Biobest distributor Plant Products. Through continuous communication, regular scouting and timely visits the program was a success. 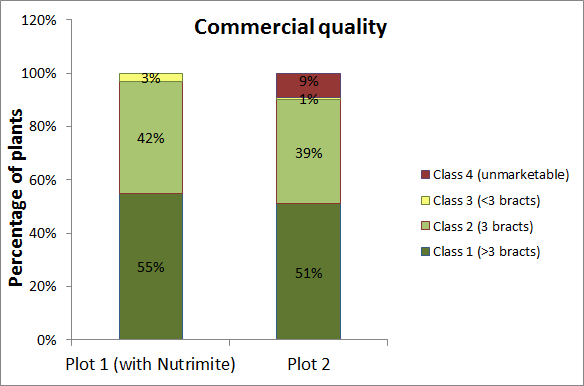 The integration of Nutrimite™ boosted the population of beneficials helping to lower the cost of both labour and overall insect control.